Check out MH Equipment in the Des Moines Register! Hyster Company has launched a new line of industrial engines designed to increase productivity and fuel economy for its 3,000 – 7,000 lb. Class IV and V product lines. The new engines from Power Solutions International (PSI) feature Hyster® Variable Power Technology™ and offer a more powerful and efficient solution for demanding applications. The Hyster® S30-40FTS cushion tire trucks and H30-40FTS pneumatic tire trucks include the new PSI 2.0L LP engine. Higher capacity models including the Hyster® S40-70FT and S50CT cushion tire trucks and H40- 70FT and H50CT pneumatic tire trucks contain the new PSI 2.4L LP or dual fuel engine. The optional dual fuel engine provides flexibility to run on LP or gas, an ideal feature for rental applications. An advanced feature that comes standard with the new PSI industrial engines includes Hyster Variable Power Technology. This technology provides adjustable performance modes that allow customers to maximize productivity or fuel economy to fit their specific application requirements. Hyster Variable Power Technology offers the ability to achieve a balance of enhanced performance and superior fuel economy or to maximize productivity during peak business periods when moving more loads is integral to the success of the operation. To realize greater fuel efficiency and improve emissions, the PSI engines also utilize the latest E-controls fuel system with an electronically controlled regulator. Hyster® trucks powered by the new PSI engines see increased maximum travel and hoist speeds, with or without a load, and increased horsepower – up to 10 percent over the previous engine. During development, the new industrial engines endured over 30,000 hours of rigorous testing, confirming engine component durability and performance dependability. This toughness is reflected in the extended service intervals and elimination of previous maintenance requirements – helping customers incur less downtime and increase operational productivity. Based in Greenville, N.C., Hyster Company (www.hyster.com) is a leading world-wide lift truck designer and manufacturer. Hyster Company offers 130 models configured for gasoline, LPG, diesel and electric power, with the widest capacity range in the industry — from 2,000 to 105,000 lbs. Supported by one of the industry’s largest and most experienced dealer networks, Hyster Company builds tough, durable lift trucks that deliver high productivity, low total cost of ownership, easy serviceability and advanced ergonomic features; accompanied by outstanding parts, service and training support. Hyster Company is part of NACCO Materials Handling Group (NMHG), a wholly owned subsidiary of HysterYale Materials Handling, Inc. (NYSE:HY). Hyster-Yale Materials Handling, Inc., headquartered in Cleveland, Ohio, and its subsidiaries employ approximately 5,200 people world-wide. MH Equipment carries a full line of new Hyster and Yale equipment*, pre-owned equipment and a large selection of allied equipment including: personnel carriers, aerial lifts, compact forklifts, truck mounted fork lifts, bailers, compactors, waste management equipment, sweepers/scrubbers, and railcar movers. Additionally, MH Equipment offers industrial equipment, parts & service, fleet services, rental, and operator & technical training to keep your lift truck up and running in a safe manner. We also have a national fleet service group with a very unique software platform that provides better and more meaningful data than any other program in the industry. If you are interested in more information about MH Equipment please provide your information HERE and one of our Equipment Specialists will contact you. 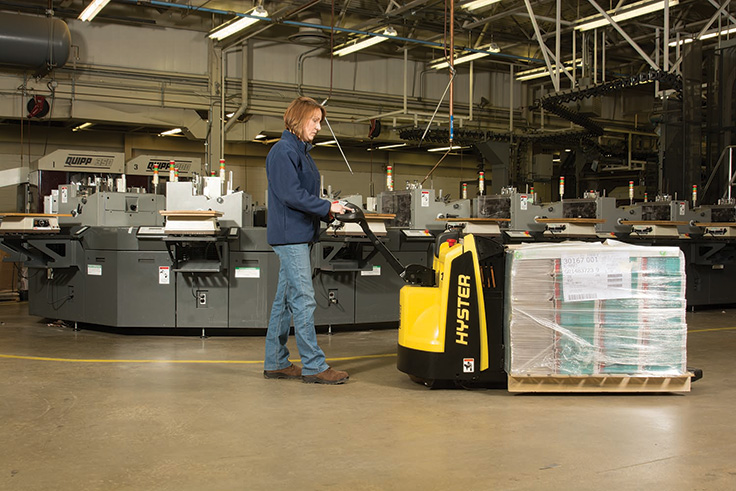 GREENVILLE, N.C. (February 10, 2015) – Hyster Company announces that it has received a 2014 GOOD DESIGN™ award for its W45ZHD walkie pallet truck. Presented by the Chicago Athenaeum Museum of Architecture and Design, GOOD DESIGN honors yearly achievements of the best industrial designers, graphic designers and world manufacturers for extraordinary design excellence. Challenge: Southeastern Intermodal Industries needed reliable and productive materials handling equipment that could keep up with the demands of their busy container business. Solution: Southeastern Intermodal Industries turned to Hyster Company and their full line of products to handle the company’s numerous materials handling needs. The company’s most recent purchase, the Hyster® H450HD-EC empty container handler, features superior ergonomic design of the cab and controls. Due to HON’s relationship with MH Equipment, Central Region Warehouse’s lift truck uptime has increased by nearly 50 percent. In addition, the Central Region Warehouse’s Fortis lift truck fleet has shown a 50 percent reduction in cost per runtime hour. The Great Day on KCWI 23 Team takes on the ALS Ice Bucket Challenge with a little help from MH Equipment in Des Moines! Their bucket is bigger than yours!!! If you are interested in more information MH Equipment a please provide your information HERE and one of our Equipment Specialists will contact you. "MH Equipment worked closely with our company from the very beginning of the process in order to fully understand our lift truck attachment requirements." says Tom Spaeth, resource manager, CONTECH. At MH Equipment we believe that People Matter and that good health is essential to a happy life. That’s why on July 14th we introduced our new MH Wellness walking program, Healthy Strides, and invited all employees and their families to participate in our seven week walking program. Everyone who registered for the program received a free pedometer, a walking log and has the opportunity to earn a Frogg Toggs® Chilly Sport Cooling Towel after walking 75 miles and a Healthy Strides t-shirt after walking 125 miles. Recently, we sat down with Brenda Hanshaw, Corporate Training Administrator, to learn the secrets of her success and celebrate her accomplishment of walking 75 miles during the first two weeks of our walking program. At the end of the second week of our Healthy Strides walking program, we already have 45 participants who have reached the 75 mile goal and many others who are very close! Great job, everyone! All participants who walk 75 miles will receive a FroggTogg’s evaporative cooling towel (the red towel Brenda is wearing around her neck in the picture below) to help keep you cool as you walk towards the 125 mile goal and a Healthy Strides t-shirt. Brenda Hanshaw, Training Administrator in our Corporate office, is one of the participants who reached the 75 mile goal last week. To learn from her success, we sat down with her to hear her view of the program and how she is logging her miles. Congratulations on walking 75 miles during the first two weeks of Healthy Strides! Can you share with us how you accomplished that in just two weeks? I get up early because it is the best part of the day and try to walk two miles in the morning and then one mile at lunch. I have always been an active person but it was a long, hard winter and I couldn’t get out and walk much. I have two grandchildren, ages 3 ½ and 1 ½, so my motivation is to get in shape so that I can keep up with them! Are you walking solo or is this a family affair? I am doing the program on my own; however, I have a rather large dog (a 110 pound Doberman!) that keeps me company on my walks. Before Healthy Strides, how would you rate your level of physical activity? Not as active as I would have liked to be. I always enjoy contests and a challenge, so this program has been good. How would you rate your level of physical activity now that we are walking into our third week of the program? Is the Healthy Strides program motivating you to walk more? It is! My activity has been more consistent since I started the program. I walk almost every morning and at lunch. Are you using the tracking log to chart your progress during the week? I am not. I just let the pedometer do the tracking. Have you had any days where you just didn’t feel like walking? How did you overcome the negative self-talk and motivate yourself? Of course there were days when I didn’t feel like walking, but I would remember my goal of getting in shape and being in good health so I can keep up with the grandbabies. And, being somewhat competitive, the Healthy Strides program kept me going because I knew I would have to report my miles. It is good that the program holds me accountable. Why do you think exercise is important? To be in good health and do what I can to prevent disease such as heart disease, stroke and high blood pressure. As we close, do you have any walking tips or ideas to increase our mileage you can share with us? I would recommend going for a walk at lunch. Use half your time for walking and half your time for lunch. It is a great way to relieve stress and get up and move after sitting at a desk all morning! Congratulations again on reaching the 75 mile goal, Brenda! For more information about MH Equipment’s Healthy Choices initiative, contact us at (888) 564-2191 or by email at info@mhequipment.com! I am writing this letter of reference on behalf of MH Equipment and Dan Brown, our account representative. Our company, Premier Direct Marketing, has a production and warehousing facility in Louisville, KY. We currently occupy a 32,000 sq. ft. building. We have been in business in Louisville since the mid 1940's. We feel we have a vast knowledge of our industry but we rely on our business partners to guide us in areas that we are not experts. One area that we must use outside help is our fork lifts and material handling equipment. Being in business as long as we have has given us experience over the years working with various Louisville companies for sales and service of this type of equipment. I am very pleased to say that we feel we have found a partner that we can rely on and trust in MH Equipment. For more than a year now we have used their services for our PM's, repairs, and purchases of this type of equipment. We feel they have been very qualified, prompt, and honest in helping us keep our material handling equipment in operation. Also we have recently purchased a forklift from them. I would also like to mention that even though Dan is our sales representative and our key contact at MH we have gotten consistently good service from others we have spoken to in this organization. I am very comfortable recommending this companies services. Thank you. At MH Rents we are 100% committed to supplying you the rental equipment you need when you need it. We can also swiftly service any need from one of our 26 locations throughout the Midwest! Simply CLICK HERE to be put in touch with your local Rental Manager today! Please Reference Unit #000030669 when inquiring. If you are interested in more information about this piece of equipment or other new and used equipment offered by MH Equipment and MH JCB, please provide your information HERE and one of our Equipment Specialists will contact you.